Did the Moon's axis shift in the past? 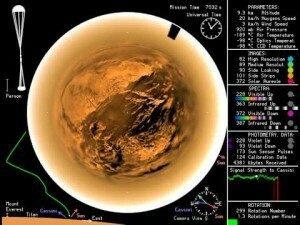 Has the orientation of the Moon shifted in the past? According to the distribution of ice on the lunar poles, that seems to be the case. The results were recently presented at the Lunar and Planetary Science Conference, and they tell an interesting story about the history of the Moon. The results are based on data from the Lunar Prospector mission, which (among other things) measure neutron emissions from the lunar surface. The neutrons are emitted by radioactive decay, and their energy is a measure of the mass of the elements they decay from. When a neutron is emitted, the atom recoils, which affects the energy of the emitted neutron. The neutrons with the lowest energy are an indicator of hydrogen, which in turn is a measure of the amount of water ice. 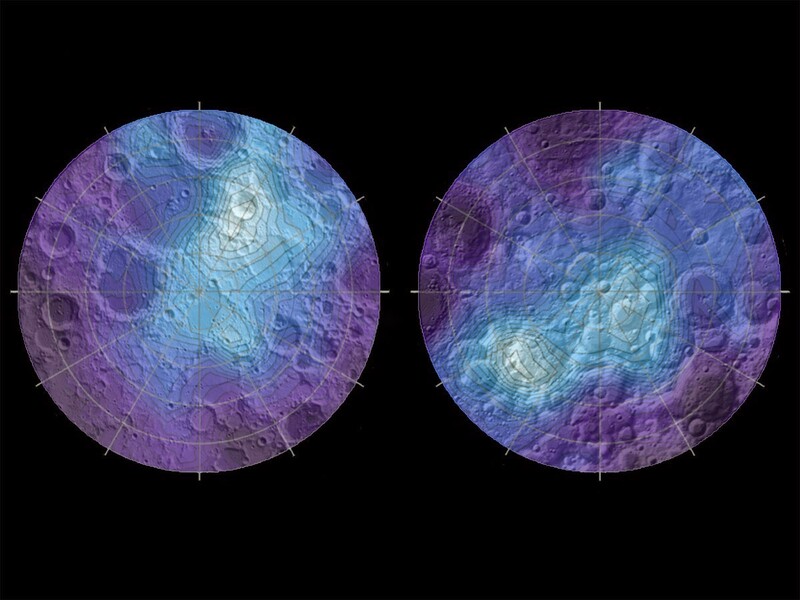 So from this data the team was able to make a map of the distribution of ice on the lunar poles. We generally think of the Moon as dry and airless, and that’s basically true, but there is trace amounts of ice near the poles. This is because the poles don’t get much direct sunlight, so it doesn’t evaporate as much off the surface. When the team created the map, they found that the ice on both poles was lopsided. More specifically, the lopsided region of the north pole was antipodal to the lopsided region on the south pole. 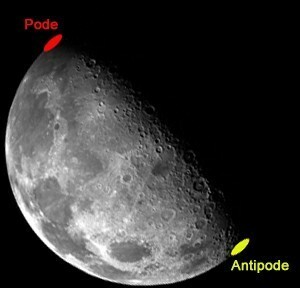 Antipodal means you could draw a line from one lopsided region to the other, right through the center of the Moon. One obvious explanation for this is that the offset regions used to be the poles of the Moon. Since they are about 5.5 degrees off from the current poles, that would mean the axis of the Moon shifted about 5.5 degrees sometime in its past. If that’s the case, there would need to be some mechanism for the shift, which is too big to be due to some kind of impact event. What the authors propose is that it could have been caused by a hot region beneath the lunar surface, which ejected lava to become the Oceanus Procellarum, that large dark region on the Earth-facing side of the Moon. This region formed early in the Moon’s history, so if such a shift really did occur, it also means lunar ice must be as old as the Moon. That goes against other evidence which points toward water forming on the Moon much later due to interaction with the solar wind. On the other hand, we’ve also found recently that Earth’s water is much older than we’d thought, so it’s possible that the Moon’s water is old as well. This is early research on the idea, so it’s a bit too early to know for sure. But it’s an interesting idea, to say the least.